"Glenbeigh Horseshoe, County Kerry: One of Ireland's Finest Hill Walks". Just magnificent. A real treasure for hillwalkers. In their own words "the Glenbeigh Horseshoe is one of Ireland's classic hill walks. We lengthened this by adding on a couple more summits at the start. 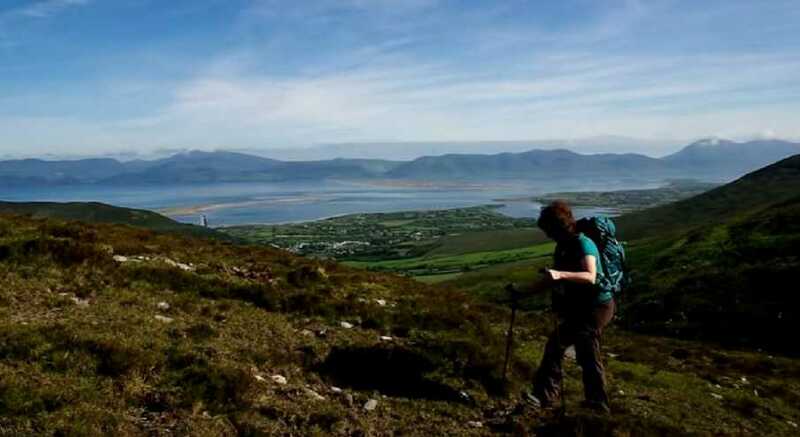 Starting on the Kerry Way from Glenbeigh along June hedgerows bursting with fragrance and colour and alive with birdsong, the route took us across 11 summits, and covered 29 km over almost 14 hours. We eventually descended Drung Hill and rejoined the Kerry Way, picking up a lift where it meets a tarred road at Mountain Stage. We encountered 360 degree scenery the whole way, including lakes so blue they might have swallowed the entire sky, small patchwork quilt patterns of ancient field systems and golden sandy beaches bathed by aqua seas. And jaw dropping scenery of The Reeks, the Dunkerrons and the Slieve Mish Mountains."